I closed on my new home in Bozeman, Montana a couple months ago and have slowly been working to furnish each room. While browsing the web last week I came across some amazing plans by Ana-White. I decided to use her idea and create my own table. The actual building process was pretty easy and it only involved one new tool investment. I didn't have a Kreg Jig, which is what I used to easily fasten all of the top boards together. It quickly became my new favorite tool in the shop because of how easy it makes it to join boards. The actual assembly cutting and assembly process took about 5 hours. The staining process added a few more days to the process. 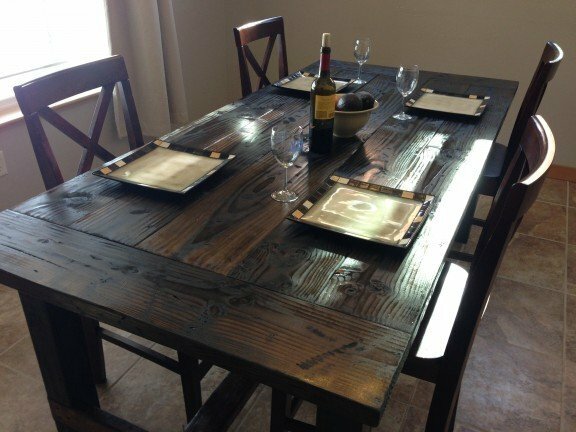 Here is the finished Farm table. I was very happy with how it turned out. 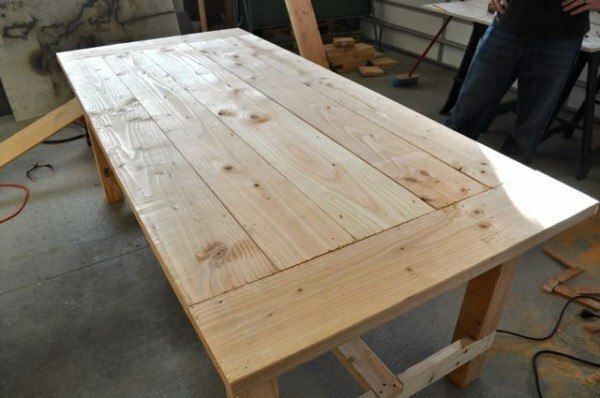 Here is another style of farm table that I made a complete instructional video for. Kreg Jig – This is the one tool I had to buy. Ana-White (the designer) has amazing instructions on how to assemble the table. 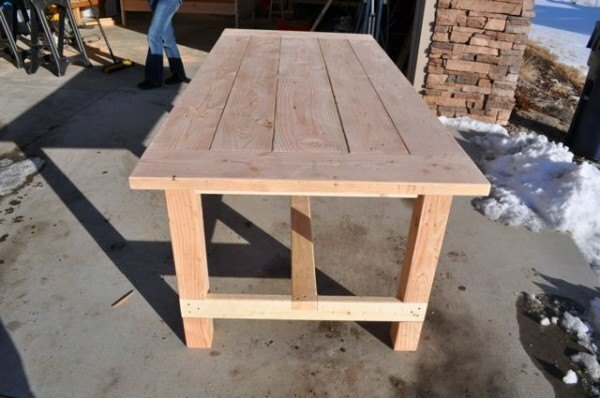 I simply wanted to show how the table I built turned out. 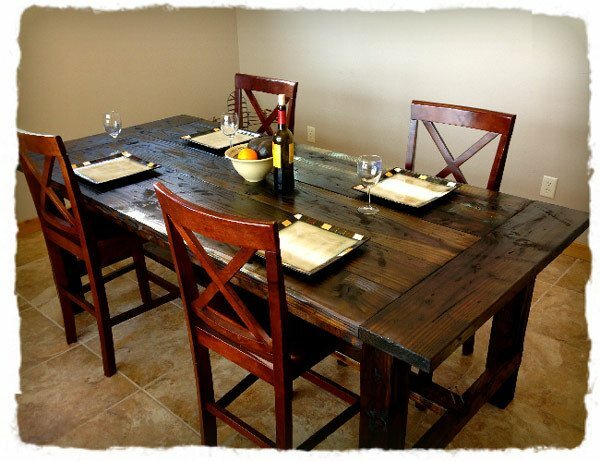 No two tables will look exactly the same, and I enjoyed the whole building process. 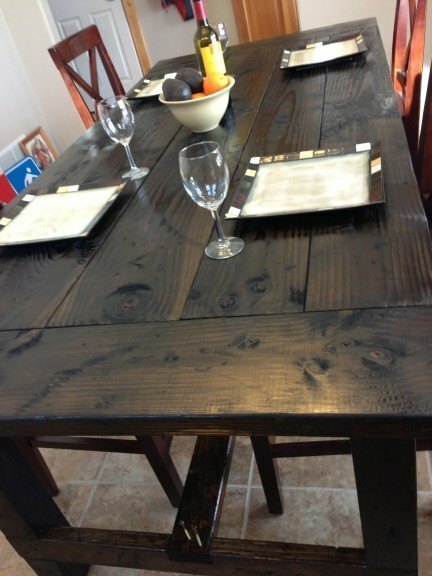 After assembling the table came the fun part… Distressing it! I grabbed a hammer, saw blade, some nails, a scraper, chains, and a pipe wrench. I simply tossed the tools on, scratched the table up, and created marks randomly. 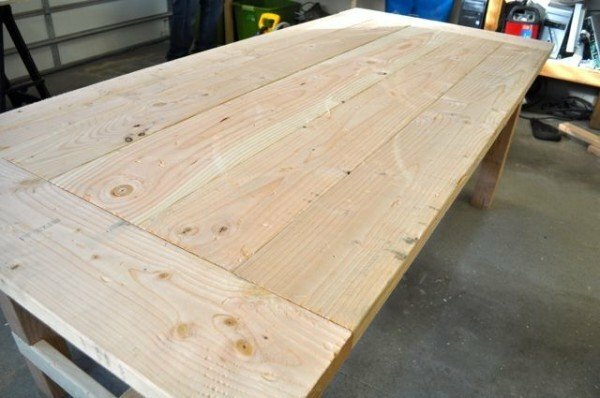 Once that was done with I sanded the entire table with 120 grit paper. Just make sure not to sand to much that you take the marks out. After distressing the table, it was time to clean off the sawdust and apply the finish. 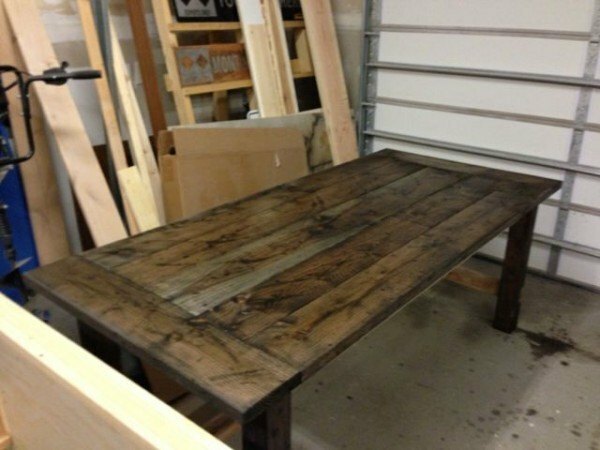 To help distress the table to look like barnwood, I mixed about a quart of white vinegar with a handful of 000 steel wool. I then applied it with a paint brush. In addition to the vinegar mixture I also brushed on a cup of black tea. You'll want to make the vinegar mixture about 24 hours prior to finishing because it takes time for the vinegar to react with the steel wool. Mix in a plastic container. Here is a photo of the vinegar/steel wool and black tea finish after 15 minutes. I let the stains mix in for about 12 hours before applying a polyurethane. Here is what the table looked like after 45 minutes. Finally the table started to darken after about two hours. The farm table continued to darken over night. 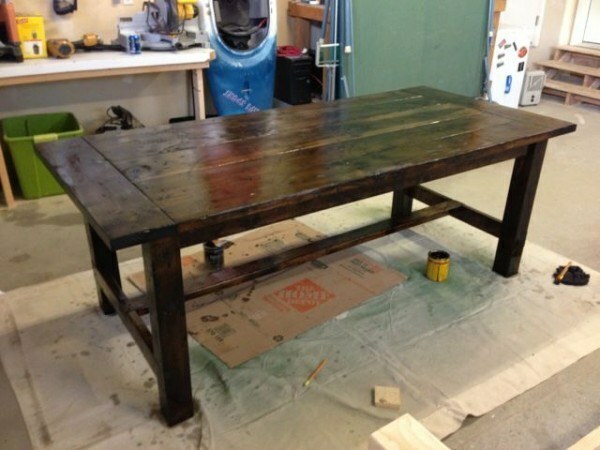 Once it was completely dry, I applied a light coat of golden oak Minwax stain. I had a couple areas that didn't take the vinegar solution as well as I'd liked, so the stain helped to even out the finish. After letting the stain dry I applied 3 coats of polyurethane to give the table a nice protective and durable finish. (2 coats to the legs/apron) and 3 on the top surface). Here is a video I made showing how I typically finish the tables. 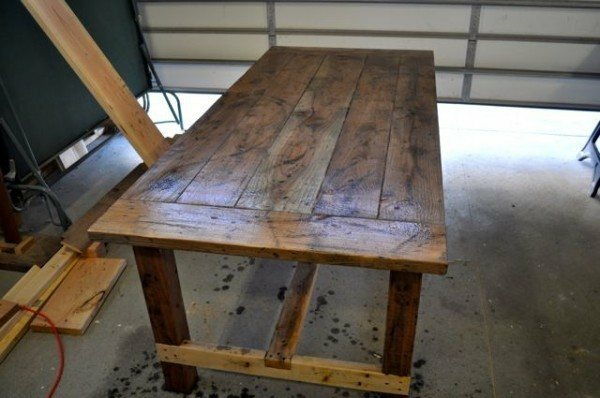 It explains the distressing, staining, and finishing techniques I used on a coffee table, which is the same as how I did the farm style dining table. 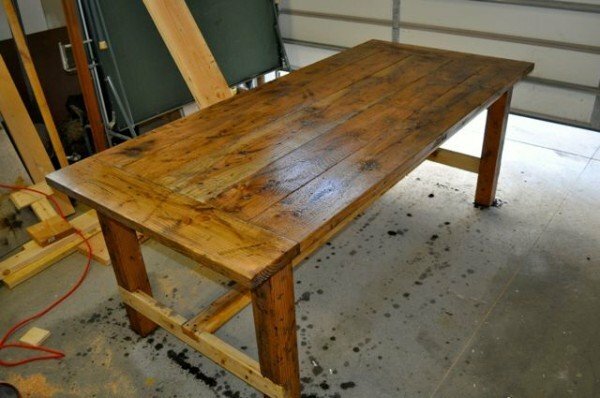 Once the polyurethane was completely dry, I grabbed a friend and we carried in the table. You can take off the bottom middle stretcher if it helps to get it through the door. I ended up taking the stretcher off to get the table in my home. You can see the 3 screws I removed on each side to easily take it off. The finished product is below. 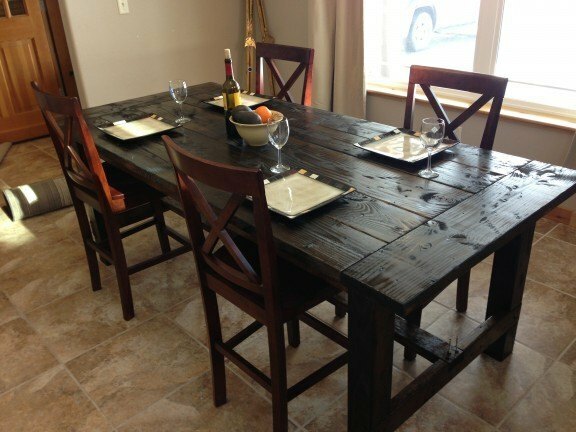 Friends and family all love this table and have asked if I could build one for them. I'd love to if I had the time, but I tell them they can easily build one themselves if they'd like. They are a pretty simple project to tackle! Please comment below. If you'd like to share your version shoot an email to pete@petesveen.com and we'll post it for you!